July 16, 2012 — Any you thought “Obamacare” was only about health care. As political Washington loves to do, buried in the health care law that has been upheld by the Supreme Court, there is a provision that singles making more than $200,000 annually and couples making more than $250,000 annually face a new surtax of 3.8% on the certain types of investment income, including net rental income. According to several reports my husband and I have read, if your income is solely “earned” from salary and other compensation from active participation in a business, you have nothing to lose from this new tax. Even if you have income above those thresholds, you might not be hit with the 3.8 percent tax, according to Kenneth R. Harney, who writes a weekly column about real estate matters for The Washington Post. Individual circumstances can, of course, complicate matters. The surtax does not interfere with the current tax-free exclusion on the first $500,000 (for joint filers) or $250,000 (for single filers) or gain you make on the sale of your principal home. Those exclusions did not change. Any profits above those limits remain subject to federal capital gains taxation and, possibly, to the new surtax. Read more from what is one of the quickest and (we believe) accurate assessments by Harney in this past Sunday’s editions of The Washington Post here. As always, check with an accountant if you have any questions. If you need a referral on a good accountant — as many of my clients have over the years — let me know. I’m glad to connect you with someone I trust. July 10, 2012 — One has to wonder if the E-ZPass “transponder” many of us use to navigate toll collections on the Dulles toll road / Rte. 267 in Northern Virginia and I-95 in Maryland on up to New York City isn’t becoming a means to increase tax revenue even though no such increase is justified by relevant costs. The Virginia Department of Transportation July 9 announced its new policy on charging for E-ZPass accounts effective Sept. 1, 2012: Customers who have accounts as of Monday, July 9, 2012 won’t be charged a monthly fee until they replace transponders or add a new one. 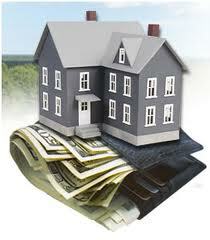 The current account holders are okay till they get a new transponder or add one to their accounts. At that point, they will be charged 50 cents a month per new standard transponder. A driver who opens a new account with Virginia after today will be subject to the 50-cent monthly fee for each standard transponder. The existing $25 deposit will no longer be required for new transponders. Account holders who already paid that deposit will have have it converted to prepaid tolls when they replace transponders. Or they can get a refund if they return a transponder and close their accounts. New customers still be be required to make a pre-payment covering $35 in tolls when opening an E-ZPass account. There is a new type of transponder: “Flex transponders”. You don’t need one of these specialized units if you don’t plan to carpool in the express lanes. People who plan to travel three to a car and get the free ride need to get one of the Flex transponders with a carpool setting. You can read more at this report by The Washington Post. And here is a Q&A that some of my clients have inquired about; it should answer just about any question you have. See my blog post here May 31, 2012 about making your views count. 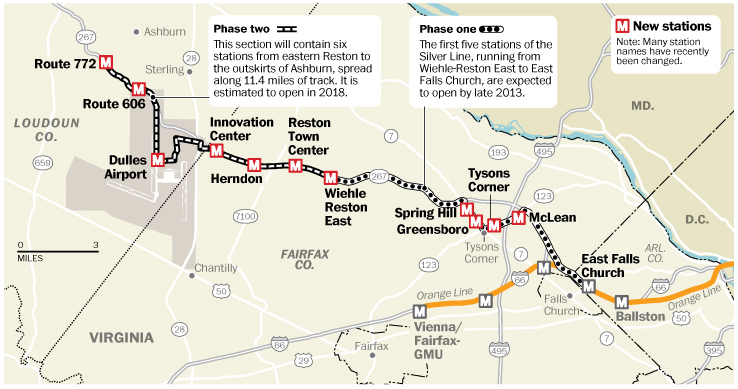 July 7, 2012 — It was oh sooooo close but the all-Republican Board of Supervisors in Loudoun County, Virginia approved the second phase of the Metro subway system’s extension into Loudoun County, including Washington-Dulles International Airport. The vote all but ensures that the Washington Metropolitan area has one of, if not THE, most accessible and cleanest commuter train / subway systems in the world. While the extension will come with costs to the county and construction inconveniences, one now can reach the region’s three airports using public transportation, without an expensive taxi ride. With his decision to support the Silver Line after strongly opposing it, Supervisor Kenneth D. Reid (R-Leesburg) delivered the fifth and deciding vote for a project that supporters and at least a few of my clients predict will have a lasting impact. Read this assessment of the vote and what it means by The Washington Post here.